You wake up every morning feeling tired with pain in your joints – it was another night when you slept poorly. You feel stabbing pain or burning sensation in your muscles, especially in your back and neck. Your body is fatigued and stiff after the whole night. Working and spending 8 hours in seated position is the last thing that you want to do. Sitting in your office chair increases the stiffness of your body, causes numbness in your legs and hands. You feel like you can’t concentrate on your work and the sharp pain in your body gets worse and worse. If you’re struggling with fibromyalgia you probably know all of this from your own experience and I don’t have to explain you how hard it is to fight with this disease. But you can fight with its symptoms and do few tricks that will help you to decrease the pain. For example, if you spend several hours per day working on a computer, it’s very important to choose proper ergonomic desk chair, whether it’s for your home office or business office. Having uncomfortable chair is as bad as not having the chair at all. Let’s be honest. Evening on the sofa is okay, but if you spend 8 hours+ curling up on your bed or sofa with laptop on your knees it’s definitely not okay for your body. It only intensifies your pain. So let’s get you the right equipment! I hope you’ll find here the best office chair for fibromyalgia that will help you to decrease your pain and work more efficiently. There are so many chairs on the market so how would you know it will help you with your pain? Well, there are few features that a chair for fibromyalgia definitely should have. First of all, choose a chair with high back. This way your shoulder blades and neck will be supported and you’ll be sitting in proper position. Forget about mid-back chairs and definitely avoid those with short backrest that only supports lower back. Adjustable armrests are another must-have feature. Of course 4D arms are ideal, but choose at least height-adjustable ones so you could rest your elbows comfortably and relieve the tension on your shoulders and neck. It will also help you with wrist fatigue and numbness in hands. Don’t forget about proper lumbar support. The backrest on your chair should be S-shaped and have built in support for your lower back. Chair with adjustable lumbar support that allow you to move it up and down and change its thickness is the best one. But probably it will be more expensive. If your budget is tight you can choose office chair with non-adjustable lumbar support and strap an additional support cushion onto your chair (more on that later). There are two more features that you should keep in mind when you’re choosing a chair for fibromyalgia: adjustable chair height and adjustable seat depth. The former one is a standard now and all computer chairs have that function. The later one is more advanced feature. It may seem like a fancy and unnecessary thing, but trust me – it will help you to find the proper and supportive position for your thighs. And you’ll be able to rest your feet flat on the floor with your knees at 90-degree angle. Without further ado, I present you three best chairs for fibromyalgia that provide exceptional comfort and support. You’ll love this chair for its multiple adjustments. It really allows you to sit comfortably for many hours and focus on your work. So what features you can find on Ergohuman office chair? You can lower or raise the whole chair, as well as change the height of the backrest – depending on your height. Thanks to that you can adjust the lumbar support so it could fit your spine curves. There is also tilt tension and 3-position tilt lock for those who’d like to take a break and relax a bit. You can lock the chair so it doesn’t tilt at all as well. Another great feature is the headrest which you can slide up and down, as well change its angle. People who struggle with fibromyalgia often complain about neck stiffness and pain, therefore having a headrest that supports neck is so important. Seat depth is adjustable too – just slide forward or backward to find the best position for your thighs and knees. Thanks to that you’ll decrease the risk of numbness in legs which is often one of fibromyalgia symptoms. Armrests are height-adjustable and they pivot left to right therefore your wrists are always supported, whether you’re writing, typing or drawing. The mesh on the seat and backrest prevents your body from sweating while giving you proper amount of the support without causing any pressure! Even people after back surgery use this office chair and most of the customers (on Amazon) praise it for help with back ache, neck tension, hip and leg pain. Keep in mind that Ergohuman office chair is most suitable for average in height and tall users (5’2’’- 6’5’’). It may be uncomfortable for a very short person. This is the cheapest option among high-quality office chairs for fibromyalgia. But as for pocket-friendly chair, it is really well equipped. Just like the previous chair, this one has high back and headrest too. The later one is height- and angle-adjustable. I only wish the headrest was covered with mesh fabric, instead of PU leather, but it’s a minor drawback. There is also seat glide function which means you can adjust the seat depth, depending on your thighs length. Lumbar support also adjusts to your spine shape (you can slide it up and down). Armrests are only height-adjustable, but it’s still a good feature at this price point. Definitely better than stationary or flip-up armrests. They will help to decrease wrist pain and hand numbness. 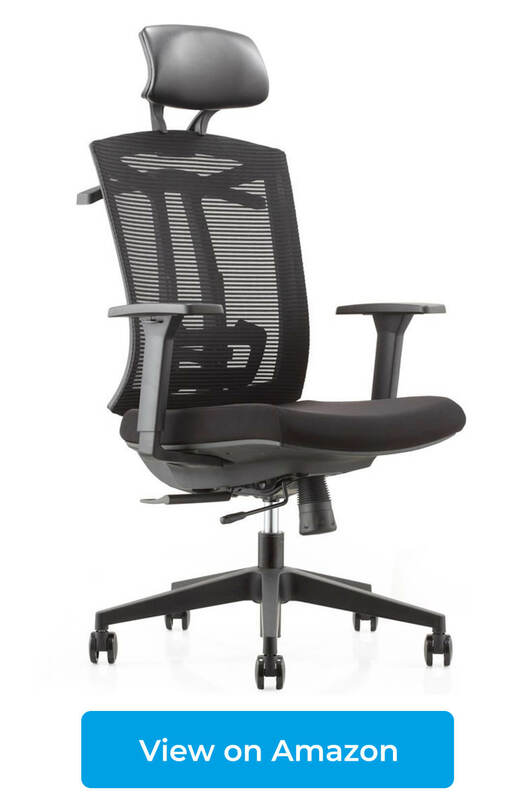 For those who like to tilt back and relax this office chair has 4-position tilt lock and tilt tension adjustment. 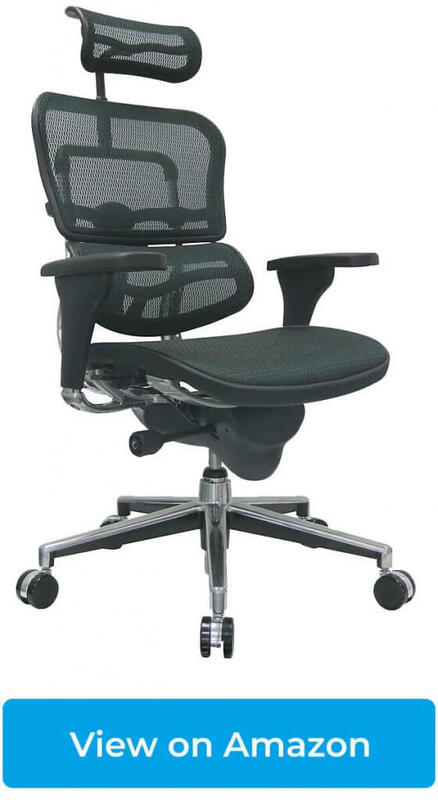 The mesh backrest provides good air circulation for user’s upper body. The seat fabric padding keep your thighs cool as well. And there’s one additional feature which turns out to be kinda useful – a hanger on the back of the seat for a jacket or bag. Nice addition. Keep in mind that this office chair for fibromyalgia is not suitable for tall people. It’s definitely less comfortable for someone above 6 ft tall. I’m not gonna lie to you, this is very expensive chair. 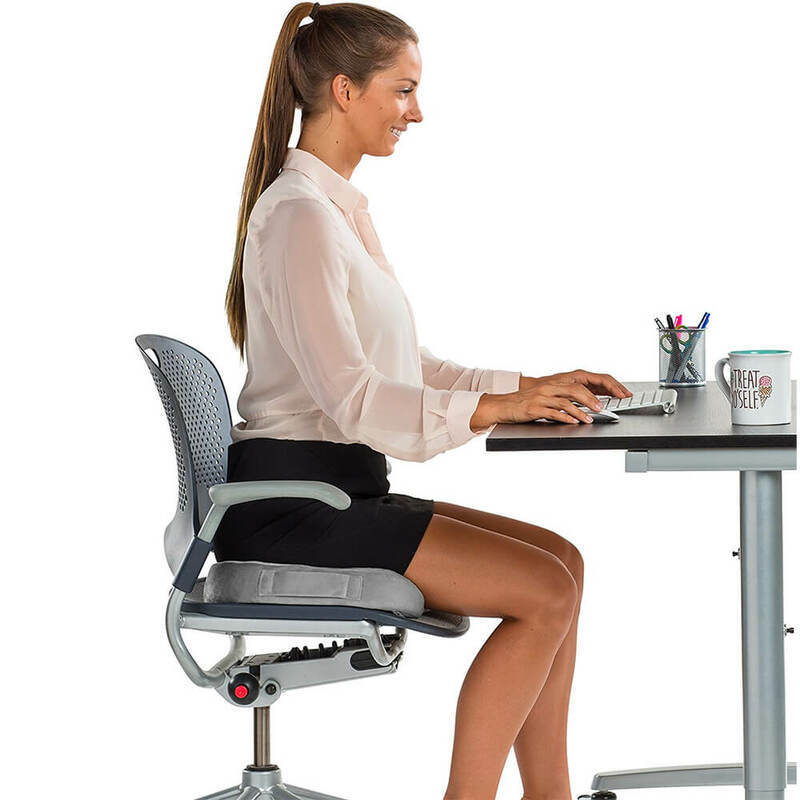 But it’s also one of the best office chairs for fibromyalgia as it provides perfect support for user’s back and helps to maintain proper posture which in turn decreases body stiffness and pain. Let’s take a look at Embody chair features. It has a high backrest which will support you from your sacral area up to your shoulder blades. It follows user movement and adjusts to his position. Unfortunately there’s no headrest. The backrest is very unique and you won’t find anything like it on any other chair. It’s similar to human back. There is central spine and flexible ribs on each side – together it provides perfect amount of support without causing any painful pressure. Moreover, you can adjust the backrest to be more curved or flat! It’s awesome because we all have different body type, shape and size and need different amount of support. With this chair everyone can find the most comfortable position for his back. 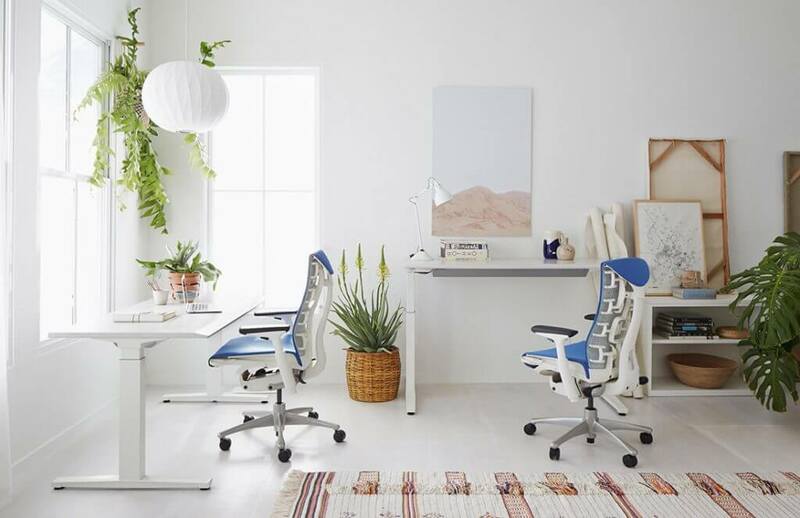 Lots of customers praise Herman Miller Embody for helping them with posture and chronic back pain, therefore it’s a really good office chair for fibromyalgia. The depth of the seat is adjustable – you can simply extend the seat pan. The armrests adjust by height and width. There’s also tilt angle and tension adjustment, but no tilt angle lock. The seat fabric is breathable so you don’t have to worry about sweating during long hours of working. According to customers it’s a big advantage. Besides, thanks to 4 supporting layers on the seat, your pain in pelvic area, hips and thighs will be decreased. Another great thing is proper weight distribution – it improves blood flow and reduces the pressure on your muscles and joints. 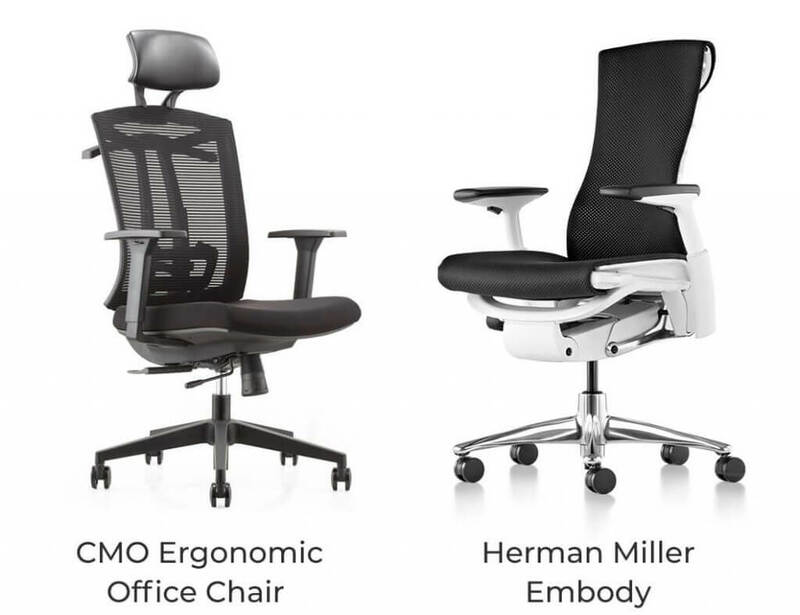 As you can see Embody by Herman Miller may help with the most common symptom of fibromyalgia. It’s also recommended by customers for people after back surgery. Of course you should not forget about taking breaks from sitting (even if your chair is super comfy) and stretching. Staying in one position for a long time may cause your body stiff. Remember to stand up every 50-60 minutes, take a short walk around the office (or even go outside if you can) and do some light stretching. It will improve the blood circulation and relieve the tension off your body. And make you more focused and efficient! 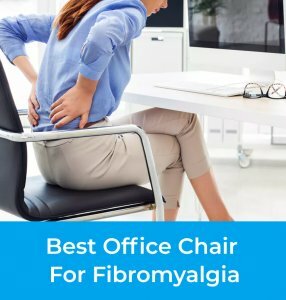 Choosing proper office chair is the most essential thing when you’re arranging fibro-friendly office space. But there are few more gadgets that can make sitting in front of the computer easier and less painful. Equipment and gadgets for office are so smart nowadays. Use them! Have you ever tried split keyboard? Frankly, I haven’t heard about it for a very long time, but when I was arranging my home office I got one and wrist pain just disappeared! Thanks to ergonomic shape of a split keyboard (for example this model from Fellowes or this Perixx model) your hands, wrists and forearms are rested in natural, relaxed position. If you’re like me and spend several hours per day on typing and struggle with wrist fatigue, split keyboard is a great solution. This is another useful gadget that will help you to be at the computer all day without hand pain and numbness. It might seem fancy or weird but trust me – it’s SOO comfortable. 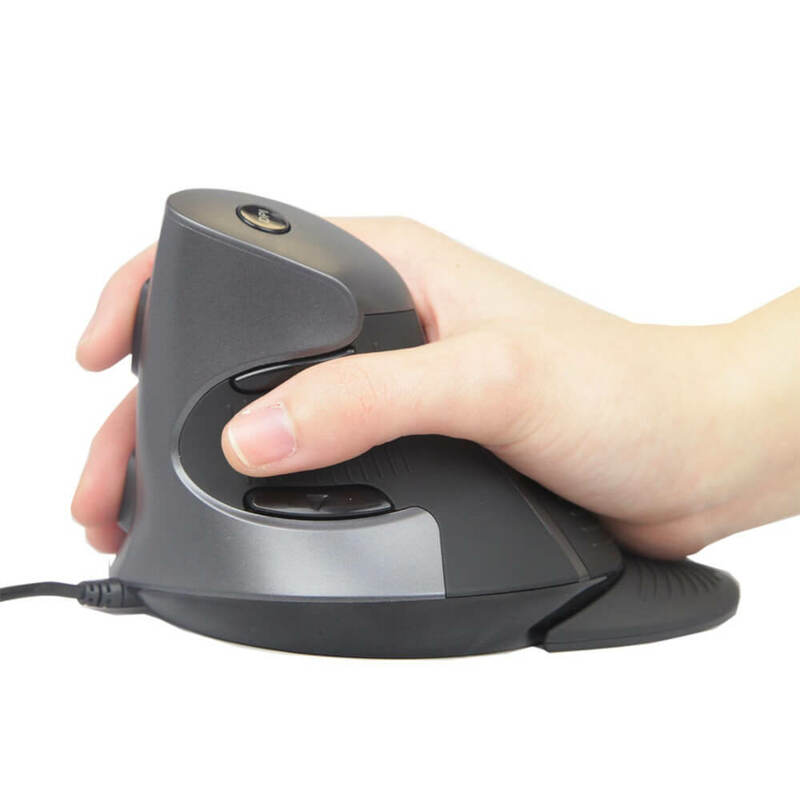 The ergonomic design of upright mouse encourage neutral position for your wrist and arm (like a handshake). 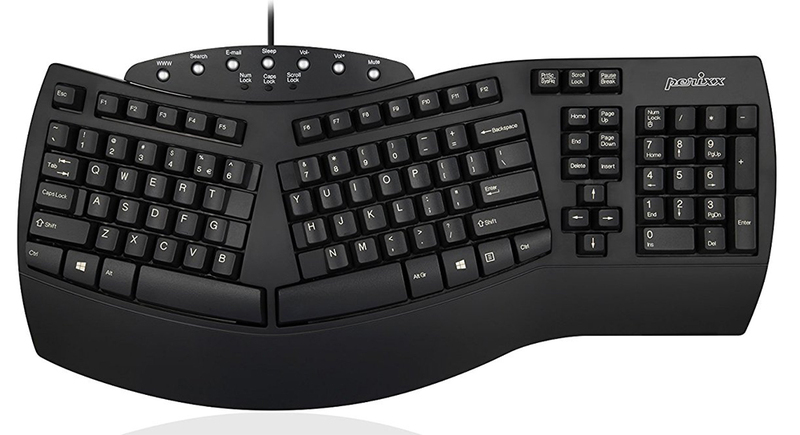 Overall it doesn’t strain your arm and wrist as much as the standard mouse. In my opinion it’s a must-have for people with fibromyalgia who often experience pain and numbness in hands (check this model from Anker or this one from J-Tech Digital). You may also want to add a special cushion on your seat (for example this one or this model) – especially if you experience coccyx or hip pain. Great thing about these pillows is that you can use them everywhere – in your office, dining room, car or even a plane! They provide necessary support for lower back and reduce the pressure off the tailbone, pelvic area, lumbar spine, hips, thighs and buttocks. Coccyx memory foam pillows are recommended for a variety of back related diseases (as well as after surgery) as they help to relieve the pain and numbness.